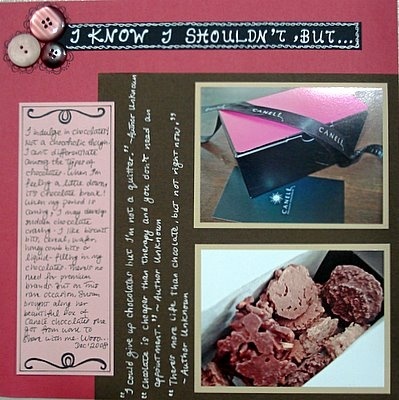 This scrapbooking idea is to tell on one of your guilty pleasures! Do you perhaps have a whole shelving dedicated to 100 pairs of shoes in every imaginable designs and colors? Are you obsessed being most updated with the Hollywood celebrity gossip? Or do you love hoarding scrapbook supplies, constantly buying and hardly using? Well, it’s your choice to share your number 1 guilty pleasure. For me, I know I shouldn’t but… I indulge in chocolates. At times, it serves as a comfort food. Oh no! When the mood is dipping low and the face isn’t smiling bright, off to the fridge I go in search for pieces of chocolate to make things seem right again. Haha… I’ve noticed sometimes when my period is coming, I might develop a sudden craving for chocolates too. Chocolates are more reliable and less hassle than say… shopping I guess. And it doesn’t matter if it’s supermarket brands of Kit-Kat, Cadbury, Nestle, etc. Premium chocolates or familiar chocolates, they all taste good. For more chocolate quote, click here. What’s your “I Know I Shouldn’t, But…”? Think about it and confess it on your scrapbook layout. Have fun! Supplies used: Cardstocks – Bazzill Basics; White pen – UniBall Signo Broad “White”; Black pen – Zig Memory System “Millennium”; Buttons – Autumn Leaves “Foof-a-la”; Sketch: 500 Scrapbooking Sketches No. 155.